​YOU HAVE APPLIANCE QUESTIONS? WE HAVE ANSWERS! SHOULD I JUST BUY A NEW REFRIGERATOR? It might be time to buy a fridge when it gets to a point where the problems are just impossible to fix. It is the same as any heavy machinery, fridges have a ton of different parts that tend to break down over years of use. Maintenance is extremely important. Always give us a call with questions because we can let you know how to help troubleshoot the problem and get you a free quote on services. ​It is completely up to you to make the decision on whether you want to buy a new fridge or get us to help you with a repair. Not all fridges cost the same amount to replace, so you can gather information about the make and model as well as the age of the refrigerator to know exactly what the cost of repair vs. buying a new one would be. WHAT FRIDGE PART BREAKS THE MOST? There are a ton of pieces in any fridge so there are lots of options for parts that break often. Quite frequently, we do respond to calls that are due to the cooling motor or fan motor breaking down. In addition, the ice maker and automatic water dispenser can sometimes break due to the consistent usage they get. It is very easy to do damage to a refrigerator door, especially if anyone in the home isn’t careful about how gently they close the door. We commonly see door problems from kids swinging or hanging on doors and causing lots of slow damage over time my pushing the door too far. Shelves that you keep in the fridge are also susceptible to damage from frequently holding heave pots and pans instead of light plastic containers. ​Of course, it is completely different for different makes, models, and brands when it comes to fridge parts and what breaks most often. Each fridge is made differently and some models are going to be able to endure more and last for longer. Our team understand different models and brands and know what to look for with each one. Any particular fridge repair can start at around $100 and range in price from there. There are many things to look at when we try to determine the cost of your fridge repairs. That is why the easiest and most reliable way to get a specific quote is to give us a shout on the phone or fill out our contact form so we can get back to you. 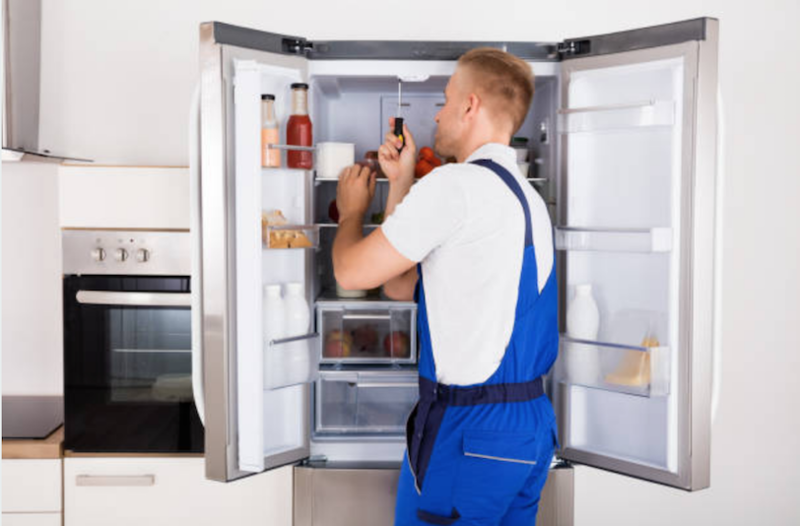 CAN YOU SHARE REFRIGERATOR MAINTENANCE TIPS? Do not swing open the door forcefully, or close it forcefully. Make sure the doors to the refrigerator and freezer are tightly closed each time. Check on your ice maker and ice levels to make sure it is not making too much or too little. Clear out the water dispenser consistently to stop the build up of mildew. Don't put a lot of weight on with products and foods on each shelf. Only put in cooled down leftovers, not hot food. Never leave a fridge door open for extended periods, this will cause wear and tear on the motor. Call us now to get even more in depth information! WHAT SHOULD I DO ABOUT A LEAKY REFRIGERATOR? When there is a leaking refrigerator it can mean one of quite a few things has happened. It is best to talk with one of our expert technicians to find out more. Our team can diagnose the problem with and find out the root of the problem with you on the phone. Guess what? Help us find the problem and troubleshoot and you get $25 off of your service!